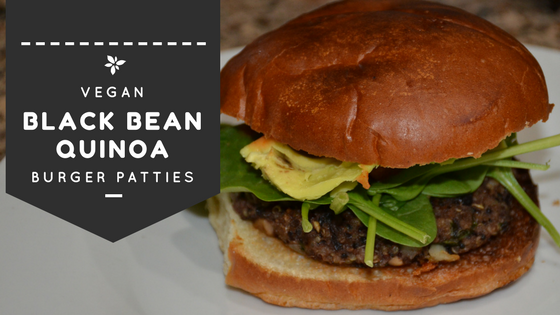 These vegan black bean quinoa burger patties are super easy to prep on a Sunday afternoon and are also good for your budget! If your family is sort of like mine you might be the only vegan/vegetarian so these are really nice to have available ahead of time when burger night comes around. Having these prepped ahead of time means I can make my husband his meaty burger pattie, while still enjoying a “burger” with him. I like to top my burger with soo many different toppings. In the picture above I topped my burger with sriracha, mustard, avocado, and spinach. It was delicious! In a food processor, process your oats to a flour consistency. Remove flour from the food processor and keep to the side. Add your black beans to your food processor, process to form a paste but also have chunks of black beans. This helps with texture. On a cookie sheet that can fit in your freezer (very important) layout wax paper. Carefully form your 6 burger patties, then place another sheet of wax paper on top. Freeze for 30-60mins. After patties are frozen you can remove them and place in freezer bag or container. To cook the burger patties, add a little oil to a skillet and cook 6 mins on each side until cooked in the middle and then enjoy!